The PCM-D100 High Resolution Portable Stereo Recorder from Sony is capable of recording audio from its built-in stereo mics in up to 192 kHz/24-bit PCM, 2.8224 MHz DSD, or 320 kbps MP3 files. It has 32 GB of internal memory and supports external memory via its SD-XC card slot. The PCM-D100's stereo mics can be arranged in 90° XY or 120° wide stereo positions, depending on the subject being recorded. The recorder is powered by four included AA batteries and can record approximately 6.5 hours at 192 kHz/24-bit PCM and almost 11 hours as 2.8 MHz/1-bit DSD. Its left and right record channels are individually adjustable, and its meters are illuminated for monitoring in dark environments. For faster transferring of files, the PCM-D100 has a USB port, allowing you to move your files directly to your Mac or PC. A wireless IR remote commander, furry windscreen, USB cable, and carry case are included. Box Dimensions (LxWxH) 9.2 x 7.6 x 5.5"
PCM-D100 High Resolution Portable Stereo Recorder is rated 4.6 out of 5 by 32. Rated 5 out of 5 by Zoe from Excellent Product, Novice, Learning Curve I'm not an audio professional, just a hobbyist who collects natural sounds and family interviews just for the pleasure of audio recording.? Have used a decent mic and minidisc recorder but went for this because of usability and quality.? Still learning how to get a completely clean recording--when subjects are not right in front of the built in mics, say birds in the yard, I get a great recording of them but there's a hiss I haven't figured out yet how to avoid.? But much better than the minidisc approach.? I have heard very clean samples of this recorder on the internet, so I know it's doable.? An enjoyable learning curve. Rated 5 out of 5 by Maestro Azzam from Sony PCM D-100 is a wow Recently I purchased the great Sony PCM D-100 in order to document and enjoy my orchestra rehearsals... As a conductor I hear the orchestra from the podium in the front center where all instruments are supposed to be heard clearly. Previously I owned four different digital recorders including the Sony PCM D-1. A few things I found the D-100 very useful and I think all will agree on them; clarity of the sound, Truly capturing in a very decent way what you (as a conductor) hear, the GREAT battery life AND recording time on both built-in memory plus the external one. No project will be bigger than the Sony PCM D-100. Is there room for improvement? Yes, but for now I am happy with what I have. Rated 5 out of 5 by mgoorevich from Sony PCM D100 an upgrade to D50 I am a professional sound recordist and sound mixer. This one was an addition to my backpack. For over shoulder production I have Sound Devices 788T and MKH8040 stereo mics.I also previously owned Sony D1, D50 and now bought D100.This is a huge upgrade in terms of quality of the mics they became bigger in size and sound better with solid bottom and balanced mid range.The pre-amps / AD converter finally very quite without any hiss (as in D1 and D50), with full frequency spectrum including sub frequencies about 40 Hz, totally lacking in previous models. A 100 dB headroom function makes the recorder hissless even for quite Back Grounds recording.Almost instant power on not 5-7 seconds as in D50. So you don't miss a thing.There are lots of improvement in functionality but the quality improvement worths the price alone. Rated 5 out of 5 by Maestro Azzam from Sony PCM D-100 is a serious business Recently I purchased the great Sony PCM D-100 in order to document and enjoy my orchestra rehearsals... As a conductor I hear the orchestra from the podium in the front center where all instruments are supposed to be heard clearly. Previously I owned four different digital recorders including the Sony PCM D-1. A few things I found the D-100 very useful and I think all will agree on them; clarity of the sound, Truly capturing in a very decent way what you (as a conductor) hear, the GREAT battery life AND recording time on both built-in memory plus the external one. No project will be bigger than the Sony PCM D-100. Is there room for improvement? Yes, but for now I am happy with what I have. Rated 5 out of 5 by Neilmc from Great.little recorder I bought this to replace my Sony pcm-d50Definitely an improvement in sound qaulity, although not drastically so.The ability to record in dsd format is a thing of beauty.I recently took this with me on a trip through Europe as an fx recorder .It is small enough to be a great stealth recorder in situations where setting up a full rig is problematic.As they say, the best recorder is the one that you have with you.I would recommend a full wind cover such as the windjammer. Rated 4 out of 5 by Conversationist from Amazing yet ideosyncratic Sony's PCM-D100 sounds beautifulthe preamps are just as clean as other reviews have suggested and the onboad microphones are equally impressive. The selection of audio resolutions leaves nothing to be desired. I've been using a PCM-D50 for years and the D100 sounds nicer. Dynamic mics sound remarkably good on it. But sound quality isn't everything and there are a lot of caveats that make the D100 an optional suppliment to the D50 rather than a replacement. As a radio producer, the D100 is almost too sensitive to use casually. You can't walk around a crowd and get quick interviews with the onboard mics because the body (flimsier than the D50) is incredibly suceptible to noise, whether from your hand or a dangling headphone cable. You need to use an external microphone or get a pistol grip and be meticulous about listening for creaks and friction. When it comes to battery life, the D100 puts in a poor showing compared to the D50 which, from my experience, typically gets more than double the run time. The D100 still puts in a decent performance, but if you're going to be doing anything epic where you need a machine that is deathless, the D50 remains a better choice. Any review of the D100 would be remiss to not shame Sony for, again, leaving XLR jacks off the machine. Also, they don't ship the D100 with a power adapter, which is simply ridiculous because one of the D100's strengths is recording sit-down interviews on location or in a home studio. Ultimately, it's not clear who Sony designed the D100 for. The sound quality and price are far above what most consumers need, yet the creakiness of the body and lack of XLR inputs are certainly drawbacks for the audio professional. When I need a beautiful ambient track or incredible studio interview, I'll use the D100. In run-and-gun situations, I'll be sticking with my D50. Rated 4 out of 5 by James from Excellent for Live Concerts It's an excellent if somewhat expensive piece of recording gear.I use the PCM-D100 primarily for live concert recording--dual system sound to replace the video's audio track as well as 44.1 kHz/16-bit wav format files for CD authoring/mp3 conversion.I've yet to discern any noise from the analog/digital converters and the DSD format sounds like it can finally give high-end analog recording a run for its money.The only real negatives are: It's a power hog--freshly charged NiMH 2300 milliamp/hour AA batteries barely last 10 hours in the DSD mode; there's currently no cost-effective option for editing DSD files; and while the recorder's constrution seems fairly robust, I'm not so sure how well the switches/buttons will hold up over the long haul, hence the reason for four stars as opposed to five. Rated 5 out of 5 by Robbie from Sony PCM-D100 An Outstanding Recorder Used for recording music and speech in the field. Audio quality and S/N ratio are outstanding. Well engineered and well built unit that is very user friendly. Minor limitations include support for only one external microphone, SD card formatting is incompatible with PC systems, the D100 cannot be used as a computer interface and standard XLR connectors are desirable. Can Sound Forge Studio LE Software be used with a mac? This software is not Mac compatible. Windows only. What kind of chip it used in adc/dac section? Burr-brown, Asahi Kasei or something else? That information has not been published. How do you properly suspend the Sony D100 such that it can be mounted atop a camera OR mounted on a flexible arm affixed to the same tripod used by the camera? It seems only the Rycote product is available for that, but the reviews on that item are quite bad. Surely someone out there uses the D100 with proper suspension? You may consider an alternate Rycote Portable Recorder Suspension mount; B&amp;H# RY41119. The overall customer rating is 4/5 stars by 22 reviewers. Hi! I can't tell you if the wireless IR remote will work on the Sony M10 because I don't have one, sorry. I want a field recorder for capturing bird songs and calls. Are the unidirectional recording characteristics of this recorder adequate for this purpose? Recordings will be post processed with Audacity and submitted to the McCauley Library which requests .wav format. Am I looking at the best recorder for the money? What is the maximum capacity SDXC card does this recorder support - 128, 256, 512GB, or even larger? And what file system does it use - FAT32 or exFAT? You can use the following memory cards with the linear PCM recorder.SD cards up to 2 GB: supportedSDHC cards from 4 GB to 32 GB: supportedSDXC cards 48 GB or more: not completely supported (Note 1)Memory Stick PRO Duo and Memory Stick PRO-HG Duo cards up to 32 GB: supported (Note 2)Note 1: To use this card on a PC running Windows XP, you need to install Microsoft Update KB55704. Fordetails, consult the PC manufacturer. When you connect your linear PCM recorder via a USB cable to an AV device that does not support exFAT*, you cannot import or play data from the device. Before connecting, check that the AV device supports exFAT. If it does not support exFAT, a message instructing you to format your linear PCM recorder may appear. Never format the linear PCM recorder. Doing so will erase all the recorded data. * exFAT is a file system used in the SDXC memory card.Note 2: The linear PCM recorder supports Memory Stick PRO Duo and Memory Stick PRO-HG Duo only.Any other type of Memory Stick is not supported. Hi there,No, this recorder can't display or output timecode. The only option would be to use one of the two tracks to record timecode via a time code sync box. However, this defeats the purpose of having a stereo recorder and only being able to record mono audio. This is a great sounding recorder for many purposes. Effects, ambience ect.There is an inexpensive zoom recorder that can do timecode. How many folders does the recorder have? Here's what the manual says: Maximum number of folders (for a drive): 400 foldersMaximum number of files (for a folder): 199 filesMaximum number of files (for a drive): 4,074 files (When 21 folders are contained in a drive. )In addition I believe you can only have 8 levels of folders: meaning this would be the limit to subfolders. All of this seems way beyond what anyone would ever need, and I certainly face no problems, but perhaps you have a special case. Is there a good power supply for this unit? Best Answer: Yes-- mine came with a 6 volt power supply. I can't remember if this power supply comes with the unit. It may have. I know I have a Sony 6V power supply around somewhere that I could use if I want. The batteries last a long time though. I've never run into a problem, but perhaps you are doing super long recordings. You don't need one. The batteries last so long you really don't need a wall wart. Take a fresh set of batteries instead! If you mean AC Power Adaptor, the Sony part is AC-ES60. Rechargeable batteries are Sony NHAAB4E. Can the D100 be used for direct computer input via the USB port. I know it can transfer recorded audio, but wonder if it can be used as if it is a USB microphone? Best Answer: At this time the USB port on the Sony PCM-D100 can only be used for simple uploading/ downloading of data to and from the recorder. Thank you very much for the reply. I hope that Sony will consider adding this feature. It might be as easy as adding some software. I believe the answer is no. There is nothing in the manual about using the PCM-D100 as a USB microphone, and there is no option to select an audio interface when making a USB connection. I believe the Zoom H2n and Roland R26 do have this capability. I haven't actually tried doing that so cant help you. A sony specialist ought to be able answer that. I found a good review of the D100 and the person who wrote it expressed regret that the D100 could not be used as a computer interface. It would be easy to implement this function electronically and it would be helpful in instances in which one might want to use the D100 for analog to digital audio input to a computer; for example, speech input to a speech recognition program. 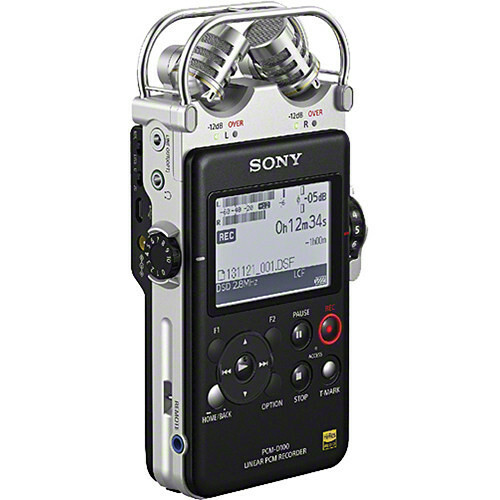 Best Answer: The remote control is not compatible with the Sony pcm-m10 portable audio recorder. I can't tell you if the wireless IR remote will work on the Sony M10 because I don't have one, sorry. Best Answer: It formats large cards exFAT, so whatever size you can afford. I use a 128gb SDXC and it adds 30 hours of 24bit/192khz recording time. You can use the following memory cards with the linear PCM recorder. details, consult the PC manufacturer. When you connect your linear PCM recorder via a USB cable to an AV device that does not support exFAT*, you cannot import or play data from the device. Before connecting, check that the AV device supports exFAT. If it does not support exFAT, a message instructing you to format your linear PCM recorder may appear. Never format the linear PCM recorder. Doing so will erase all the recorded data. * exFAT is a file system used in the SDXC memory card. Note 2: The linear PCM recorder supports Memory Stick PRO Duo and Memory Stick PRO-HG Duo only. Any other type of Memory Stick is not supported. You can use SDXC cards less than 48 GB formatted to exFAT file system. The following is a quote from the manual. It uses exFAT for a file system on SDXC memory cards. Best Answer: Five per memory medium. The internal memory has five, and each plug-in Memory Stick or SD has five. It names your recordings by date and puts them into currently active folder. I'm using mine for both live recording and digitizing old LP's and 78's. It has a great Analog-Digital Converter and makes better recordings than my CD Recorder. I used the PCM-M1 until I got the D100. It had a great ADC too. In addition I believe you can only have 8 levels of folders: meaning this would be the limit to subfolders. All of this seems way beyond what anyone would ever need, and I certainly face no problems, but perhaps you have a special case. I believe you can set up multiple folders. Out of the box, there are 3. Can you record with intern and external mic at the same time? Best Answer: No. Connecting an external microphone disables the internal microphones. Ok. Thanks. Do you know, if it is possible to connect PCM-D100 with Shure VP88 Stereo Condenser Microphone? And would there be any disadvantage in doing that - regarding recording quality, etc. What kind of cable do I have to use? No... External Mic and Internal Mics can only be used independently. I would like to acquire a stereo microphone (or microphones) that is the equivalent or better than the built in microphones of the Sony PCM-D100. My reason for this is to allow me to handle the recorder without generating noise in the microphones while recording sounds of nature. Suggestions? Best Answer: Hi Jerry C., We would suggest the following Rycote mount and handgrip kitâ€¦ https://www.bhphotovideo.com/c/product/1054427-REG/rycote_46024_portable_recorder_kit_for.html. We recommend this, as the mics built in to the PCM-D100 have a frequency response of about 35k, and are wider frequency response than most professional mics. If handling noise is the main concern, then the Rycote should handle that. If the recorder needs to be placed remotely, and closer to the sound source, one can use the included remote control that comes with the PCM-D100. One should think of this as a digital recording microphone, in that sense. Best Answer: You may consider an alternate Rycote Portable Recorder Suspension mount; B&H# RY41119. The overall customer rating is 4/5 stars by 22 reviewers. Best Answer: That information has not been published. No, this recorder can't display or output timecode. The only option would be to use one of the two tracks to record timecode via a time code sync box. However, this defeats the purpose of having a stereo recorder and only being able to record mono audio. This is a great sounding recorder for many purposes. Effects, ambience ect. There is an inexpensive zoom recorder that can do timecode. Best Answer: This software is not Mac compatible. Windows only.